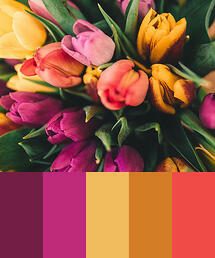 Spring means flowers, and flowers mean absolutely lovely Color Palettes! 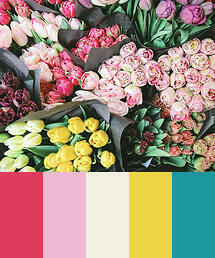 Here's a sampling of some lively spring inspired colors to add a pop to your designs! You can get gorgeous images like the ones seen here at Unsplash, an amazing collection of free, high quality photographs. We also have a more in-depth blog post about 5 Free Stock Photo Sites Graphic Designers Should Bookmark that you should definitely check out if you're looking to spice up your designs and give your wallet a break! Let's take a look at some great Typefaces that are sure to bring some springtime joy to your designs! These three are fresh, fun, and a little playful to convey the spirit of the season. 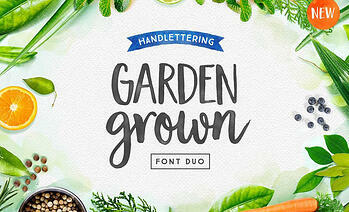 Garden Grown is a lovely typeface duo designed by Cindy Kinash. The set includes a sweet script typeface on the bottom and a playful caps sans serif on top. Garden Grown is perfect for designs that need a handmade feel. The gentle, organic curves of its letterforms inspire thoughts of gardens, plants, and flowers. If you need to add this wonderful typeface to your collection, you can get it right here! 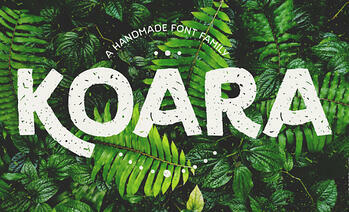 Koara is an earthy-crunchy, hand crafted typeface perfect for designs that need a natural touch. Created by Rosario Nocera, the letterforms of Koara are unique and a little wonky, which will bring the spice of life to your designs! There are two versions for you to choose from, rough is the base typeface and wild is a version with a little more texture, as well as 3 weights! So take a ride on the wild side and try out Koara! 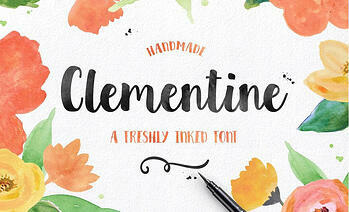 Let's take a look at the delightful Clementine, a handmade and freshly inked font! This tangy typeface was created by Emily Spadoni and is an excellent addition to your collection if you're looking for a script typeface with personality. While being handmade, the letterforms of Clementine are crisp, clean and bold! This makes it perfect for designs that need something a little more eye catching! Add this treat to your list here! You've got your colors, typefaces, and now it's time to hook you up with some Free Design Elements! 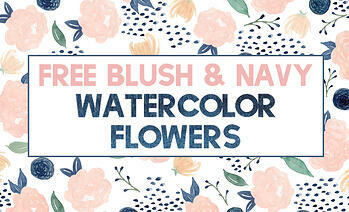 To get us started we have this lovely Blush & Navy Watercolor Flowers set created by Fox + Hazel. This set includes JPGs and PNGs of each watercolor illustration, has top and bottom bouquets, a pattern, flower elements, and foliage elements! There are plenty of pieces to choose from to add a soft, delicate touch to your designs. You could even build your own pattern out of all the pieces included in this bundle! Get the package here for all your springtime design needs and be sure to check their website for other examples of their work! 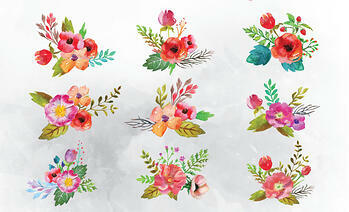 Next we have 9 Free Watercolor Flower Vectors from Graphic Google. These elegant illustrations will bring the pop of color to your designs that you are looking for. They are perfect for embellishing a corner or framing a header in your designs to add a touch of delicate beauty. You should definitely add these flowers to your collection and you can do so by going here! 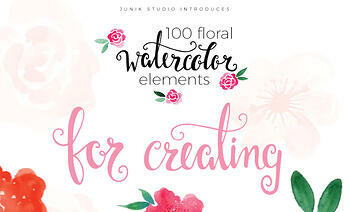 To wrap up we've got a wonderful bundle: I'm talking about 100 Floral Watercolor Elements from Junik Studio. We've got 100 PNGs of watercolor flowers, leaves, textures, dots, and so much more for you to use in your designs. There is a lot you can do with all of these pieces. You can make wreaths, logos, borders, patterns, and so much more! The possibilities are truly endless, so don't miss out and get them here! 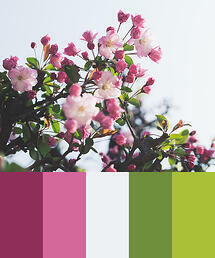 Where do you find inspiration in Spring? Flowers, plants, fauna? This is the season of new beginnings and it's a good time to jump start your designs!